The Wyoming Fire Department wanted to surprise their award recipients at the annual banquet by presenting them with an award that was completely unexpected and a total shift from the traditional wood plaque they had come to expect. With a bit of planning and creative pursuit, this amazing three-dimensional, deep-etched, and colorfilled award was born! This flawless optical crystal award was designed with the utmost in detail, color, and depth as possible. 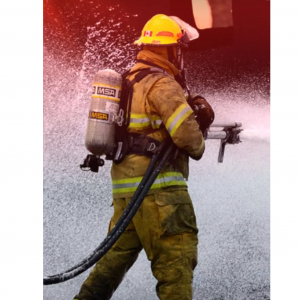 For example, all the specifications of the firefighter’s uniform can be seen in the 3D laser engraved imagery, while the background boasts the power and heat of a roaring inferno. 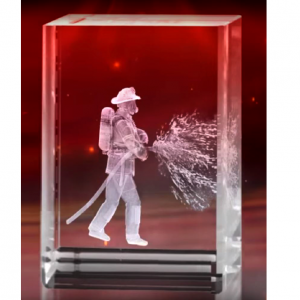 As the award is rotated from left to right, the artwork produces the illusion of a firefighter spraying water to douse the flames. Three different imprint processes were used to create this show-stopping award. 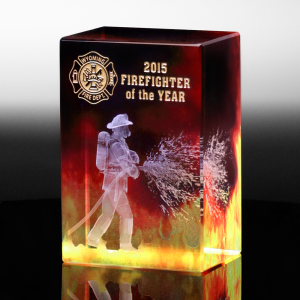 Three-dimensional subsurface laser engraving was used to craft the firefighter while our four-color vibrant Illumachrome™ was used to re-create a menacing fire. Lastly, the deep etch with colorfill imprint process was used to capture the Wyoming Fire Department logo on the front of this perfect optical crystal cube. The firefighters that received this award could not believe how exceptional it was in comparison to the traditional wood plaque they had expected! Hands down, this was considered a symbol of achievement, and it was admired. The recipients and the audience were captivated by this stunning award and excited to show it off to their friends and family. Bragging rights around this award took roots, and soon it was the most sought-after symbol of recognition that the department had known. To download the firefighter case study flyer, click here.